All things considered, it was a less than auspicious start to my Davos adventure. Ready and packed for this year’s World Economic Forum, the one thing we couldn’t plan for was the weather. And in the the battle between punctuality and the wintery blasts, I sadly didn’t stand a chance. After Swiss Airways decided to cancel my midday flight from London, I managed to dance cheerfully between various airports as flights were booked and then cancelled, booked and cancelled, over and over until the only remaining option was to trudge towards Heathrow and await a 6am flight. Let’s not take this as omen, eh? Waking at the ungodly hour of 3:45am, it was time for my second attempt at getting to Zurich. I gathered my belongings, said a prayer to the snow-filled skies above and headed to the airport. Fortunately, today the Davos luck was with us, and I boarded the flight flushed with both success and cold. As we flew, I was lucky enough to get some advice two fellow Young Global Leaders (YGLs) – Jimmy Wales (founder of Wikipedia) and Kate Garvey (Director of Freud Communications) – Davos veterans both. They suggested I “buddy up” with someone whilst at the conference; ideally someone from a different “world” to mine, in order to meet a broader range of people during the time there. Buoyed up by thoughts of the week ahead, I was rather punctured when I heard their second bit of advice – Pace Yourself. Apparently sleep would be the only topic not up for discussion. With my Davos survival tips duly noted, I landed into Zurich and got a call from another YGL – Niall Dunne, Chief Sustainability Officer of BT. I had the opportunity to talk to him about the fascinating world of sustainability, as well as the work that Niall is doing at BT. What’s encouraging to hear is that sustainability is now a key part of the corporate agenda, and this arena is looking for fresh ideas and bright minds to push the boundaries. It sounds like a brilliant space for aspiring young talent passionate about the nexus of social and business issues, and made me all the more impatient to get to our final destination – these are the things we need to talk about! And so, after fighting off the elements, I made it to the YGL session at Davos, just in time to do my “insight blast” – a talk about new ways to support youth employment – which hopefully I’ll be able to share with you soon. More to follow – what’s so good about sleep anyway, eh? 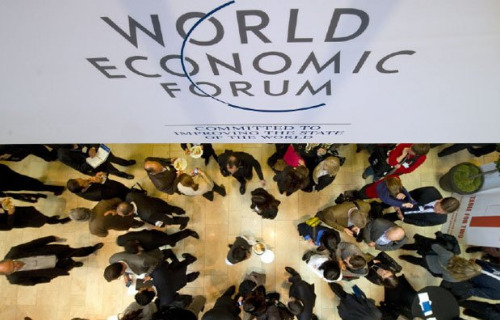 What do entrepreneurs and students need to know about Davos? Find out here. For to-the-second updates, follow @rajdey on Twitter, and follow @enternships for the round-ups as we get them!